Getting keys to guests, cleaners or maintenance staff can present a logistical challenge and an unnecessary hassle. Furthermore, as a holiday let landlord, you can’t always be sure how many copies of keys have been duplicated by guests, contractors or have been lost. When guests are on holiday they want as few things to worry about as possible and gaining access into your holiday home is often a challenge. They have to coordinate with property managers and other members of the holiday party when arriving or leaving the property. There is also the worry they could be locked out, lose the keys and – who else might have a key to the holiday rental? If you are not on-site to meet your guests on arrival, then you need to have a foolproof way of ensuring guests can effortlessly access your holiday home. Here some ways to eliminate the hassle of keys. Not ready to ditch the keys? If you don’t want to switch to smart locks, then one of the most popular tried and tested methods absent holiday cottage owners use is a lockable key safe to store keys. These are typically mounted on an exterior wall near to the door. Authorised visitors simply use a unique push-button combination to access the key 24/7. Key safes are by far the best alternative to leaving a key under the doormat or a ‘hidden’ under a flower pot! 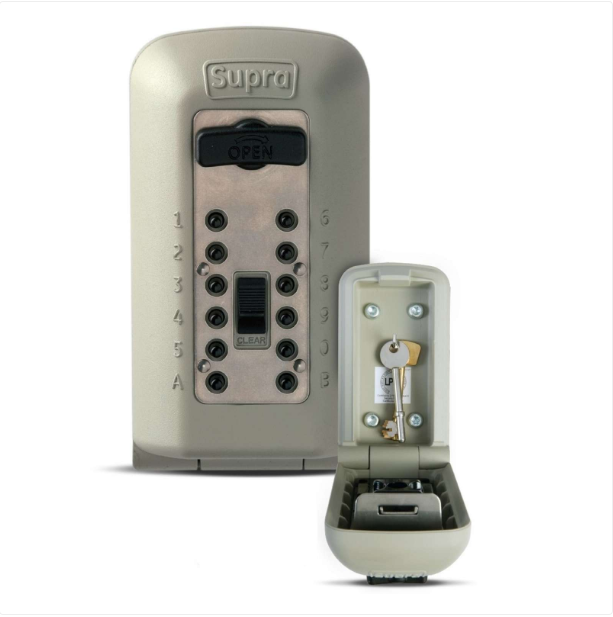 The Supra C500 coded Key Safe is the original Police accredited key safe that can store up to 6 keys. Change the code between lets, set it to the last 4 digits of the guests mobile or their year of birth so they don’t forget it! You could also remotely monitor who accesses your key safe with a CCTV camera or a product like the Ring Video Doorbell. An electronic alternative to store your keys is the igloohome Smart Keybox. Guests unlock the Keybox by entering a unique PIN code which you create via the igloohome app and send to the guest. The PIN code expires after a set duration, so you won’t have to worry about unauthorised access to your holiday property in the future. Bluetooth is an alternative way to open the Keybox – simply use your smartphone within range to unlock it. The keybox can be secured over a doorknob or mounted on a wall. If you want to bypass sending guests physical keys, you can use an electronic code lock that opens the door with a punch-in code. Most models allow you to program multiple user codes, making it easy to create and delete unique codes for your guests. Electronic door locks are typically battery powered, but if the batteries run out, you can always use a traditional key as a backup. Smart locks come in different shapes and styles, but what they all have in common they allow you to remotely manage who is authorized to open the door and for how long. So, if you have a guest coming for exactly one week, you can limit their ability to unlock the door to the duration of their stay. You can also give your cleaners or handyman separate codes too. Smart locks will also send you a notification when the door is locked or unlocked, allowing you to keep tabs on when guests check in and monitor who is in your holiday home at all times. This is useful if you use a professional cleaning service who charge you by the hour. Although smart locks need a Wi-Fi signal to enable you to manage the device remotely, they continue to function without a Wi-Fi connection. Guests can unlock the door with a unique digital key code or by using their smartphone’s Bluetooth. If there is a problem then you can open the door for them remotely and most models can still be opened the old-fashioned way, with a traditional key. Ensure you choose a smart lock that can be opened with a key, as problems happen! Smart locks are battery operated and have a sensor to let you know when the batteries need to be replaced, so you won’t get caught out. 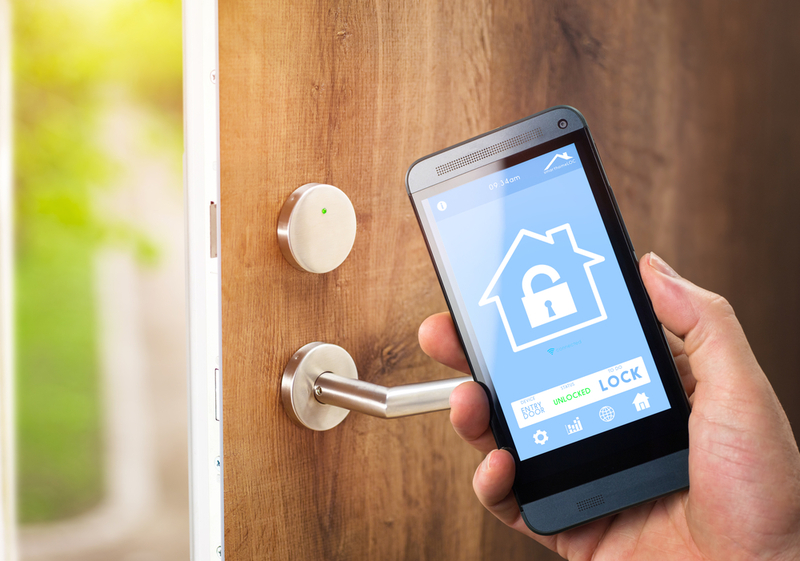 Not all your guests are going to be tech savvy, so you will most likely need to provide instructions (or a video) on how to use your smart lock. Do these affect your insurance? Remember before you make any modifications to your holiday home, like installing a key safe or switching to smart locks, then you will need to tell your insurance provider so that they can assess any added or reduced risk to your property. This could mean a change to your premium and a warranty being applied. For example, theft isn’t covered unless the code is changed after every let and if keys are left in the key safe for more than 24 hours. Also, if someone breaks into your holiday home through an unlocked door or using a key (e.g. you carelessly ‘hid’one underneath a plant pot or a guest left it in the unlocked key safe) will your insurance cover you? The answer could be no. Some insurers insist there must be signs of forced entry. (Note If your insurer doesn’t provide this cover, our holiday letting insurance covers theft by non-forcible entry). So, the overall message here is to never leave a spare key anywhere where it can be found and to check your policy small print. If you are not on-site, then you need to have a foolproof way of ensuring guests can easily access your holiday home on arrival and depart at the end of their stay. Although many owners successfully a use key safe, by installing a smart lock you can control who is authorised to access your house remotely, saving you time and making life easier for you and your holiday letting agent. Plus, guests love the convenience and security of smart locks and not having to deal with keys. No more hassle of replacing lost keys and wondering who has a copy, and no more accidental lock-outs! Do you use smart locks in your holiday rental, share your tips in the comments below.